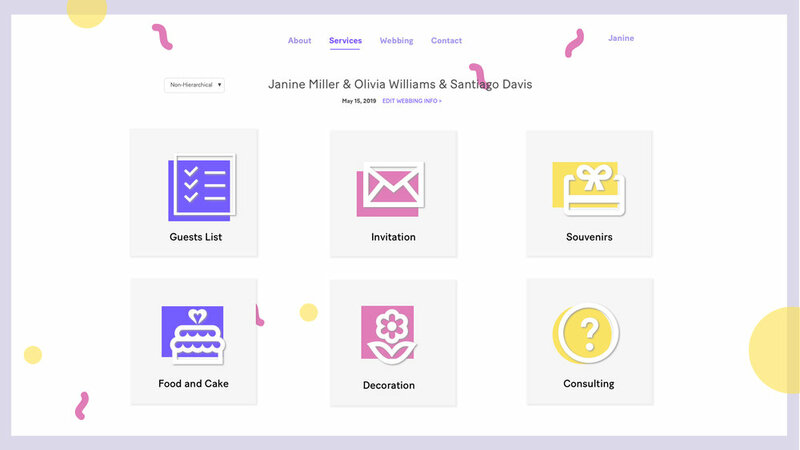 On the website, users have access to a range of services including consulting, invitation design, and party favor customization. In the website’s onboarding experience, users are required to provide basic information like the type of relationship, the number of partners, and whether the relationship is hierarchical or non-hierarchical. Webbing sets out to eliminate stigma around non-monogamous relationships by de-centering monogamy as the standard for relationships. Webbing sets out to eliminate stigma around non-monogamous relationships by de-centering monogamy as the standard for relationships. Yangying started her primary research interviewing various subject matter experts. Patricia Johnson, coauthor of the book Designer Relationships: A Guide to Happy Monogamy, Positive Polyamory, and Optimistic Open Relationships, told her, “The default way we live today is centered around the idea of the nuclear family and couples that only reflect the monogamous design model.” Yangying’s research also led her to various online communities. More Than Two, an online polyamory community, argues that there is a long list of couple-based privileges that populate our daily lives, like hotel rules and child adoption policies. Starting with the question, “What would the wedding experience be like for multiple spouses?” Yangying led a co-creation workshop with people practicing non-monogamous relationships. During the workshop, Yangying invited the participants to reimagine wedding invitations and party favors for non-monogamous weddings. “When it came to souvenirs, they emphasized the poly dynamic—designing a multi-angle-spinner and a poly Rubik’s cube,” Yangying shared. Inspired by that activity, she designed a series of invitation cards where the names on the card spin, to indicate non-hierarchy in a relationship.